These policies and guidelines govern the development and maintenance of all information, resources and services on the University network that are accessed through a web browser. Draft Web policy: The requirements that conform to legislative and other regulatory requirements and establish a clear identity for the University on the World Wide Web. Web guidelines: Requirements, recommendations and suggestions for best practice. Accessibility: Guidelines to ensure that everyone can access your website. All official web pages must be accessible and meet accepted world-class standards. Metadata: Details of which metadata tags / fields need to be completed for UWA web pages. Content style guide: Tips for writing content for the web plus spelling conventions used across UWA sites and standard formats used to lay out web pages. Structure and navigation: Advice on how to determine what should be presented and where. 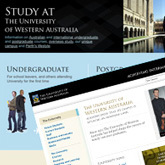 Digital is responsible for the visual identity of all official University web pages. For most content, this is handled automatically by the web publishing facilities and content management systems offered by Digital. Official websites and applications outside central web publishing facilities are required to use the University's visual identity in a consistent manner. If you are implementing a new web application, or want to migrate an existing application to the visual identity, contact UWAs 'Digital' so you can be provided with access to markup, scripts, style sheets, and images hosted on central servers. The Digital should be included in your processes as early as possible, as it is a requirement that we authorise use of the visual identity before a site goes live. Our templates may evolve over time, so copying the look of another site will not ensure compliance.